Progressive reddish-brown 'apple-jelly' nodules. Endemic tropical areas. Starts as small hypopigmented spot. Becomes red patch with raised borders or pale spot. Non-healing cut to finger developing a red tender plaque. Painless subcutaneous nodule or pimple developing over weeks into large undermined ulcer. Endemic areas tropics, Africa, Australia. Anti-tuberculous treatment Antibiotics dapsone, rifampicin and clofazimine (and others). Oral corticosteroids and thalidomide useful for preventing nerve damage. Antituberculous drugs, cotrimoxazole, and high doses of minocycline have been advocated. Surgical excision and grafting. Antibiotics have little role Rifampicin with streptomycin or clarithromycin. 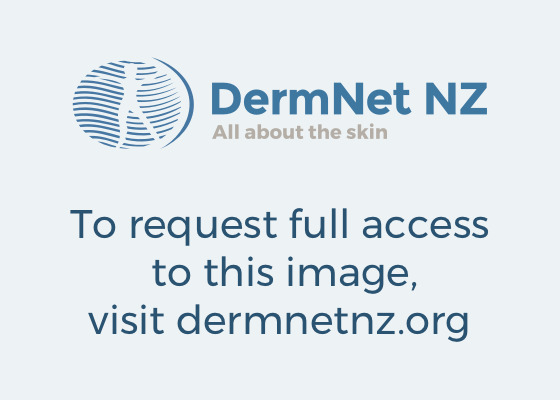 Images Copyright DermnetNZ, dermfoto and CDC.